If you've monetized your blog but aren't happy with your blog's income then this article is for you. 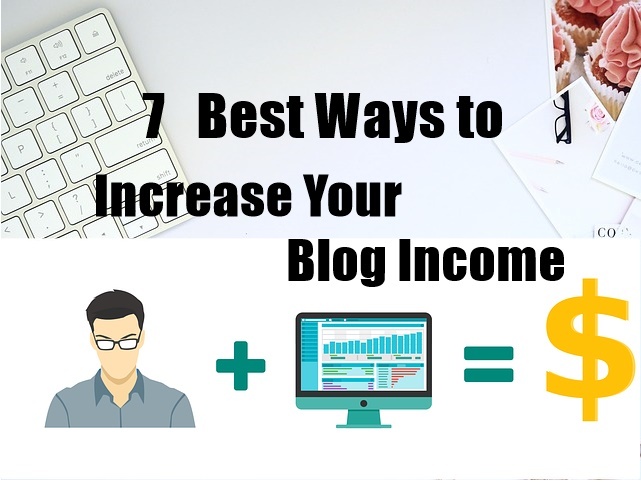 Because we're going to tell you in this article 7 Best Ways to Increase Your Blog Income. I can understand that when someone leaves a job and blogging does not come from his block every month, then it is natural to be disappointed. But if you have made a blogging career then you have to try and increase the earnings from your site. I am sure that you can Increase your blog's income with these methods. For this, please follow our methods below. To make money from blogs, it is important to have traffic on the blog. There are no two opinions that the more traffic your blog will have on your earnings. This is the first and the best way to Increase Your Blog Income. Try to increase the traffic of your blog, as much as possible. If you can increase your site traffic, you will increase your income. You can not just depend on an Income Source (Google AdSense) There are many more ways to earn money from blogs. You can increase income by adding income. Use affiliate marketing, if there are already done so, there are many more ways. Such as. Running ads on your blog (Or run more ads). Providing coaching or free launching services. Sell Your Own Product (E-books or Online Course). Paid Post (Review, Promotion, Sponsored) Share on Blog. Making a Donate Page is that people can donate money. There are many ways in which you can increase your blog's income. Keep an eye on the other bloggers of your Niche and see what methods they take for earning. If you use Google AdSense, you need to pay attention to Ad Placement. Try changing the ad which is getting less revenue from it. Experiment and increase your AdSense income. If you have already monetized your website with many different Income Networks but still you are not able to earn enough, then you need to make your conversion rate increase. If you have written an article about many affiliate programs on your website and now you have stopped selling them, then you need to work on them again. If you sell any of your products on Ebook, Online Course, on your site, then you should promote it on your website besides reactive other websites from the product. You can give some promotion commission to your promoting sites. It is a better way to Increase your blog income. It is sometimes better to lower your product prices. Because this gives us more and more cells. But you can increase your income by increasing the price of your best product. Some of the products that you sell on your blog (such as e-books), 1-2 will be the best performers. You can increase your income by increasing its value. Branding yourself can prove to be Master Tips to increase your income. Because people prefer to buy a product through a professional and top blogger compared to a new blogger. For example, you can see our top and professional blogger Harsh Agrawal. Those who get more sales than the rest of Blogger. If you can be able to brand yourself, then it is obvious that you will earn three-quarters of your previous Same blog. If you want to Increase your blog income, then follow the above methods. Your block earnings will be double in the coming time. Who knows where it takes you to? But I would definitely say that it will definitely help you transform your dreams into reality and in the coming years, you are included in the list of (more earning bloggers). Hope you like this info and with this help, you will be able to increase your blog's income, earn more money from your blog, and be happy with blogging. Share this post with other bloggers so that they can also help in increasing the income.